Dubai: The Dubai index hit its highest level in 2019 as renewed buying in Emaar Properties triggered a more than 2 per cent rise in Dubai index. 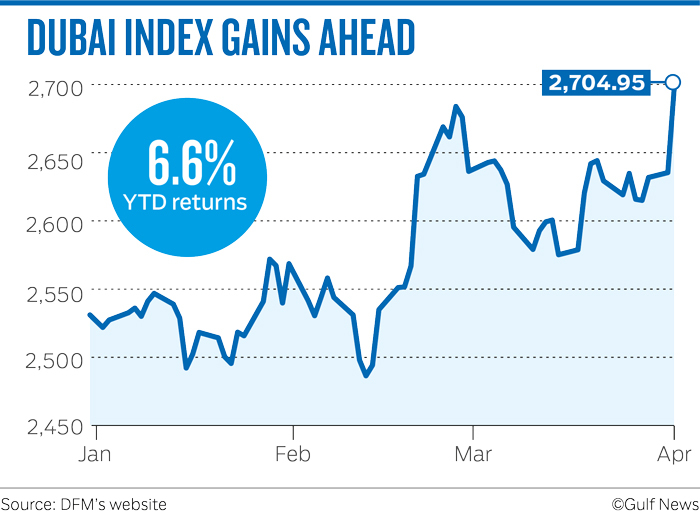 The Dubai Financial Market general index rose to a high of 2,704.95, before closing 2.35 per cent higher at 2,696.85. This brings the total gains to 6.6 per cent in the year so far. Emaar Properties closed 3.97 per cent higher at Dh4.97. Emirates NBD closed 4.5 per cent higher at Dh10.50 after reports of strong demand for the IPO of Network International. Dubai Islamic Bank (DIB) closed 0.62 per cent higher at Dh4.88. “The trend in DIB is sideways down with resistance at Dh4.95 and support at Dh4.78/4.70 level,” Shiv Prakash, senior analyst with First Abu Dhabi Bank Securities. In other stocks, DP World closed 1.23 per cent lower at $16. The Abu Dhabi Securities Exchange general index closed 0.38 per cent lower at 5,055.29. First Abu Dhabi Bank closed 0.53 per cent lower at Dh15.12. Union National Bank ended 0.95 per cent higher at Dh5.31. Since the start of the year, Middle East equities are up 7.7 per cent, still lagging global indices who have been catching up the sharp drawdown observed in the fourth quarter of last year, according to Al Mal Capital. Elsewhere in the Gulf, Tadawul index in Saudi closed 0.87 per cent higher at 8,896.55. Total traded value stood at 3 billion riyals. The total value of shares traded for the month ending March 2019 amounted to 61.74 billion Saudi riyals, up 31 per cent compared to previous month. The total value of shares purchased by foreign investors during this period amounted to 10 billion riyals representing 16.19 per cent of total buying activity. The Muscat MSM 30 index closed 0.57 per cent lower at 3,960.99. The Dubai Gold and Commodity Exchange (DGCX) said it has recorded 20.4 per cent year-on-year growth in March, trading over 1.84 million contracts with a notional value of over $36.6 billion. Average Daily Volumes (ADV) throughout the same month also increased, registering 87,995 contracts. DGCX also successfully launched two new contracts. “The products have been very well received by investors and traded a combined total of 598 lots on their opening day,” DGCX said in a statement. “The consistent growth of our product suite and trading volumes is a key measure of our recent success, and comes as a direct result of our expanding member community,” Les Male, CEO of DGCX said.